I guess you could say this is a short-cut version of a sweet potato mash. Kinda sorta. As much as I love making a big family-style casserole dish, I don’t enjoy the extra prep work of chopping, boiling, mashing – you get the idea. And if we took a minute to discuss the boiling part, I would say we then need to add sugar, fat and ‘cream’ to bring back the flavor we lost in the orange-tinged water left behind. Let’s skip all that, shall we? I went as far as peeling these big spuds (they really are big, as in about a pound each big) then bake them up until they are so tender and SWEET you need to lift them with a spatula. Easy enough while tending to other Thanksgiving make-ahead things on my menu, like stuffing and cranberry sauce. The longer-than-average baking time gives them a heavenly mashed potato texture without any rough skin edges, all the deep caramelized color, and flavor, with a rich creaminess that your ‘butter’ and ‘cream’ would be jealous of. That good. Reason I peel is partly to avoid the potato scrub and because I am all about shortcuts these days, but that’s not really the reason. Really more about not allowing any chewy potato skin to get in the way of my creamy mash experience. And since this is Thanksgiving recipe, I’m adding pecan syrup to dress them up. 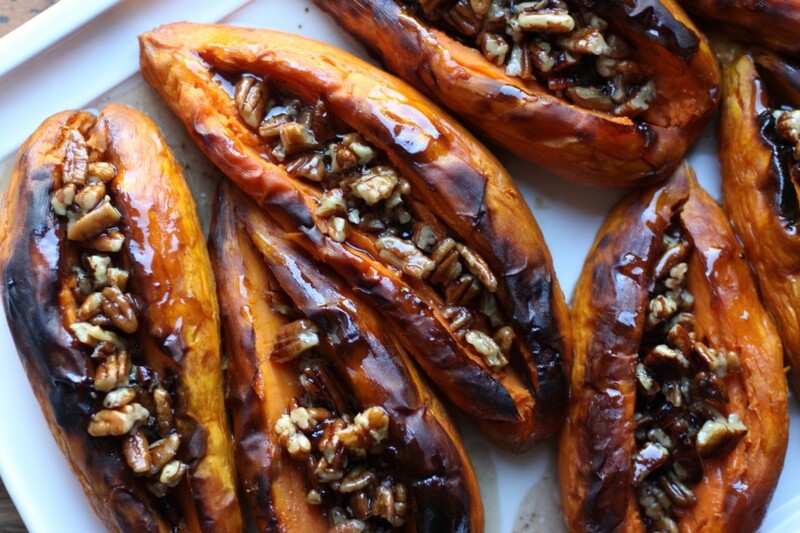 One extra step I didn’t leave out was toasting the pecans – it makes a world of difference. I have never used cassava sweetener before but since the sale price was too tempting, I went with it. I’m glad I did. It has the same consistency as glucose and corn syrup, yet it’s fructose free (and other ‘frees’) that makes one fine pecan syrup. Sugar is sugar as we all know, but aside from the thick consistency, perfect for syrup, I like that the sugar content is lower than say a maple syrup or honey. Maybe it will keep us from passing out on the couch this year, and bring on a new found energy to make our way through the black Friday hustle and bustle … fingers crossed. If you don’t have it on hand you can certainly go with another liquid sweetener you love. I bought it at my local health food store but think they sell it online. This may be my new favorite (easier) version of a sweet potato casserole (without the mash, ha.) … Thanksgiving where are you? I’m hungry. 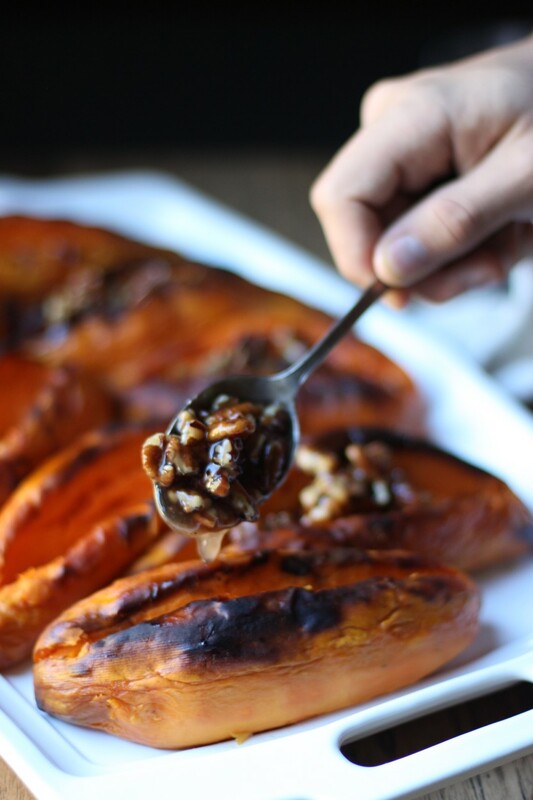 Simple roasted sweet potatoes roasted long enough to create the melt-in-your-mouth texture of a sweet mash, without the extra effort or added calories, topped with pecan syrup to bring it to another level of yum. This is the BEST Thanksgiving sweet potato side dish you will ever meet! Preheat oven temperature to 400 degrees F (204 C) *Line a rimmed baking sheet with parchment paper. Combine oil, and coconut sugar in a small bowl then rub into each peeled potato. Place potatoes on the baking sheet. Bake for 80-90 minutes, until very soft (the texture of mashed potato). Meanwhile, toast pecans slightly, about 2 minutes, on medium heat (just until you smell the nutty aroma) If using pecan pieces, remove any pecan shell pieces before adding to syrup. 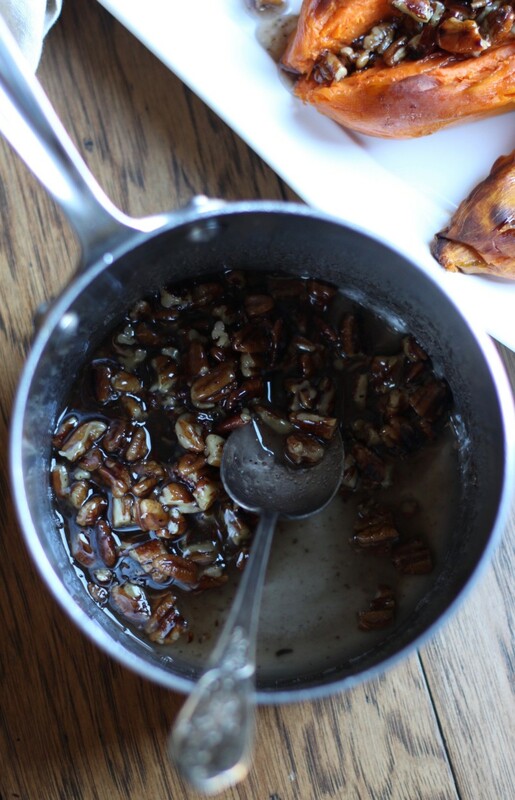 Prepare pecan syrup by combining water, cassava sweetener, and kosher salt in a small saucepan on medium-high heat set with a candy thermometer. Note: a candy thermometer isn’t absolutely necessary but does take out the guesswork. Once it comes to a boil, continue to cook for 6-8 minutes, until it reaches 230 degrees. Remove from heat. 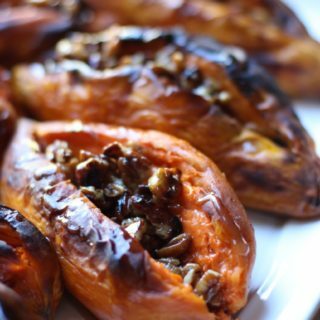 When the sweet potatoes are done, slice into the middle, lengthwise, and pierce the sides open to make room for the pecan syrup. Spoon a few tablespoons (about 3) into the center. Serve. If the syrup has cooled to a thickened consistency, reheat for a minute to thin out. If cassava sweetener is unavailable, sub for maple syrup, or (blonde) coconut nectar. The potatoes I used were large, about 5-6 inches long and roughly 3-inches wide, weighing nearly a pound each. For smaller, thinner potatoes check them at the 45-minute mark, for doneness. You also won’t need as much oil and sugar for coating. 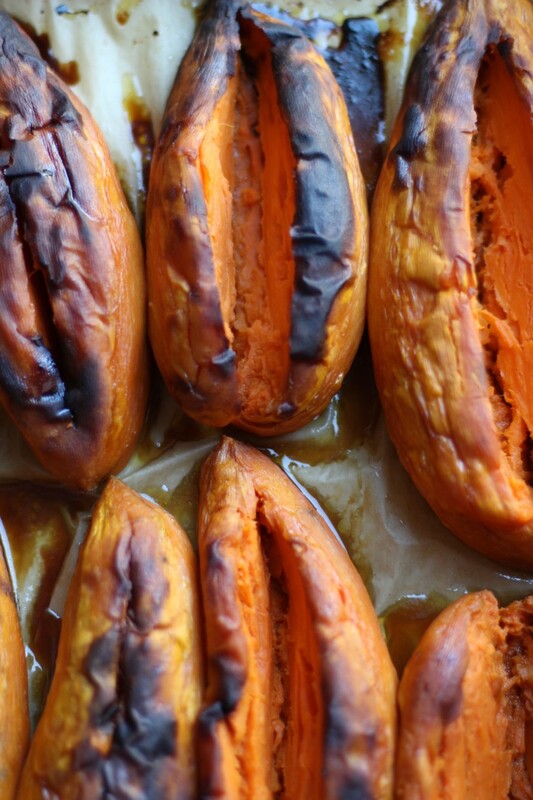 To make ahead: bake sweet potatoes the day before and keep refrigerated. Same can be done with the maple syrup. 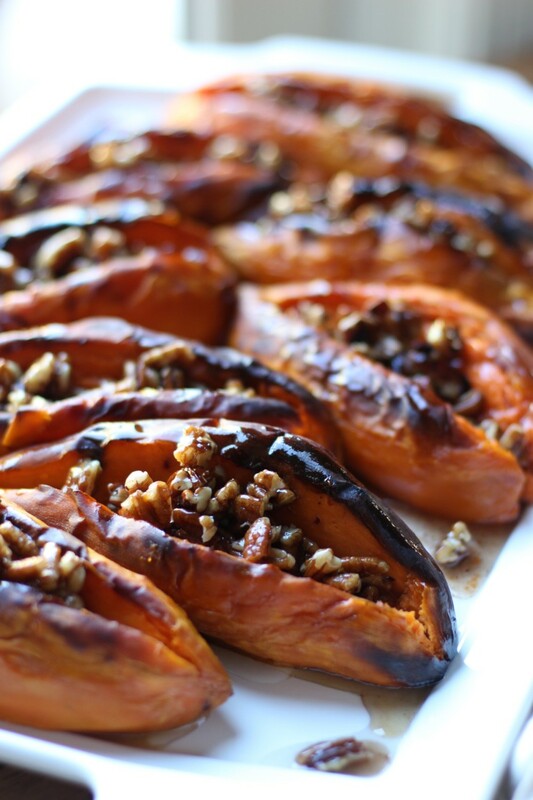 Before serving reheat sweet potatoes at 325 degrees F for 25-30 minutes (less time for smaller sized), and reheat pecan syrup to warm and assemble before serving. Great variation on our standard sweet potatoes and marshmallow dish. This will certainly be on our holiday table this year. Love everything about this and those photos! I always roast my sweet potato with the skin on before I purée it in the food processor then add bacon and pecans on top and bake for 15 minutes but now thinking why not make it easier and serve them like this...looks so pretty!! Thanks for the idea! I let my potatoes bake longer than I ever per your instructions then scooped up some of this divine syrup to fill as pictured and served it to my family last night with roast chicken and your caesar salad (halved the recipe since we are four) and all I have to say is WOW!!! These are as creamy as mashed sweet potatoes! This was a hit with even my marshmallow obsessed kids! Such a nice way to take a simple baked sweet potato and dress it up. Delicious! This recipe looks amazing as a dessert. I'm going to have to try it! I've done the same concept with peaches, but I bet the texture of the sweet potato is amazing. 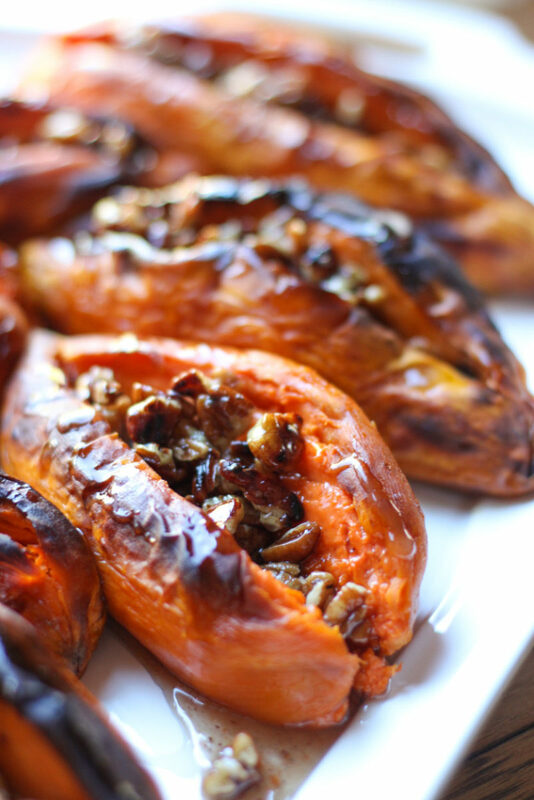 It's decadence and happiness all in one big hunk of sweet potato ;) You must try! Love the idea of using peaches (love peaches), will have to try come summer!